Here’s the final episode of On Safari. Your most pressing questions answered! Q: So, what’s a typical day like on safari? 5:30am—Ranger calls to wake us up for the morning game drive. 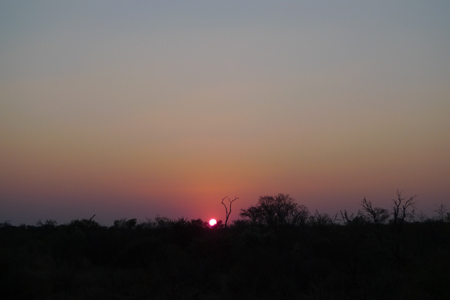 We spend the morning hunting the Big 5, in awe of the sunrise over the bushveld, and learning about all the pretty bird species. 9:00am–Back at the lodge, we enjoy a continental breakfast with fresh fruit, warm croissants, fresh juice and coffee. Then we either sleep, read a book, workout or bum around. 12:30pm–We meet at the main house for lunch, a huge vegetable salad with grilled shrimp. The rest of the afternoon we either get a massage, explore the lodge library or bum around. 3:30pm–We meet at the main house for a proper English tea and quiz the staff about their families and life in South Africa. 4:00pm—Ranger joins us and asks what we hope to see on the evening drive. As we explore, Ranger explains the history of the reserve which reaches back to the Stone Age! 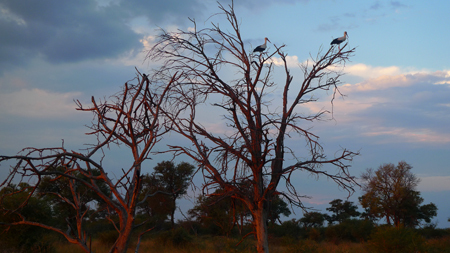 6:00pm—Ranger and Tracker secure a safe location for a sundowner. Chef has prepared a picnic basket of finger sandwiches, cookies and wine for us to nibble and sip to our hearts content. 8:00pm–Back at the lodge, we shower and dress for dinner under the stars. We encounter a creepy crawly in our room (OMG!) and since we’ve been asked to “respect” nature’s ecosystems and not kill anything, near tears, we beg lodge staff to get rid of it and check our room from top to bottom before we return. 8:30pm–At the main house, we mingle with other guests over cocktails, then dinner is several courses of South African specialties prepared by the Chef. 10:00pm–After dinner, we hang out in the great room sharing stories of our day’s adventures and playing a vibrant game of charades. 12:00am–Lights out, until tomorrow’s wake up call. Q: So, how many days do you stay on safari? I’ve found that 3 nights/2 days is plenty for me. Q: When’s the best time to go on safari? 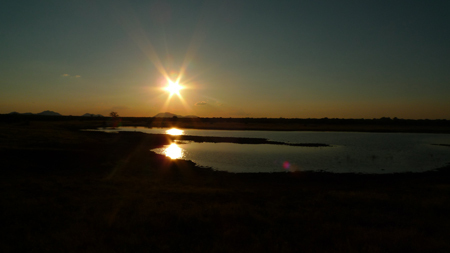 For South Africa, during dry season, their winter months of May-August for the best game viewing. Q: What do you wear on safari? Finally!!!! Safari attire must blend into the landscape, so don’t wear any white because it draws animal attention. Shades of brown, khaki, olive or grey are best. Layering is crucial because it’s hot during the day, but chilly at night. And long sleeves protect you from mosquitoes and stray tree branches as you drive through the bushveld. Note: There are luggage and weight restrictions (usually 22 lbs. per person) on charter flights to the game reserves, so over-packing is a no-no.